I worked there as Saturday tea oik for a while in my mid teens. I still speak to a couple of the guys. Tim Bright the owner is alive and well and still living in Surrey, and after the shop closed for a while was part of Vivante (vinyl importers). I still see most of the regular customers around Kingston, Wimbledon and Teddington. Great days. Commnet: Rob Millis. (May 27, 2013) CC Rider said:I spent hours and hours in this shop from the 70s to 90s when it closed. 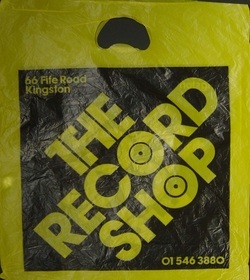 It was run by someone knowledgable and with a real passion for music and knew about the music they sold.